After an unusually wet winter, a section of South Coos River Lane near Coos Bay, Oregon slid into the river in March, 2017. 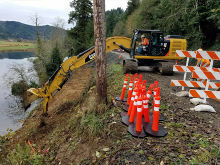 Coos County made emergency repairs that allowed one lane of traffic on the road until a permanent solution could be engineered and constructed. David Evans and Associates from Salem, Oregon was selected as the engineering firm on the project and went to work on the plans. West Coast Contractors (WCC) was selected as the general contractor by competitive bid in November, 2017 and began preliminary work immediately thereafter. 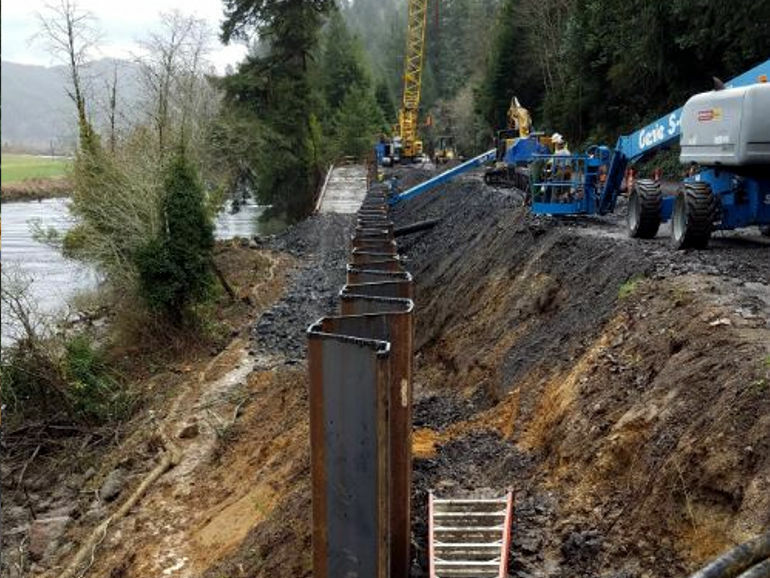 The work consisted of a sheet pile retaining wall approximately 300 lineal feet long with a double row of tiebacks up to 100 ft. long anchored into rock. The sheets were driven to a depth of 55 ft. to the subterranean sandstone that is present throughout the area. 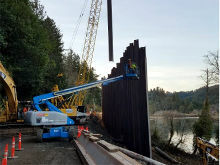 Once the wall was completed, the area was backfilled and paved, completing work in May, 2018. WCC has been busy with many such repairs brought on by the wet El Niño conditions during the recent past, and was pleased to be working with Coos County and David Evans and Associates on this project.